What happens when you roast grapes? They stay intact, and shrivel just a little. Their natural sugars concentrate and caramelize, creating an explosion of wine-y, sweet juice when you pop one into your mouth and bite down. They’ll spoil you, because eating a fresh grape just won’t be the same anymore. 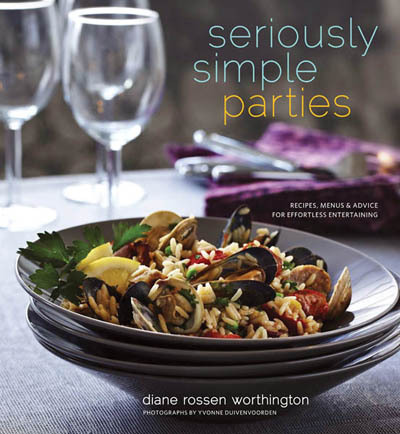 It’s from “Seriously Simple Parties” (Chronicle Books) by veteran cookbook author Diane Rossen Worthington, of which I received a review copy. And who couldn’t use more seriously simple entertaining ideas with the holidays upon us? The cookbook, with recipes arranged by season, is full of ideas for appetizers, soups, entrees and desserts — no matter if you’re entertaining a small or large gathering. Each recipe includes tips for making things ahead of time, too. For example, with this salad, the vinaigrette can be made a week ahead and the grapes roasted 8 hours before serving. It’s a simple salad, but with a “wow” factor from the grapes, which sparkle on the plate like little jewels. The vinaigrette is a smoky-tangy blend of roasted shallots, roasted garlic, sherry vinegar, Dijon and olive oil. The caramelized shallots really lend a nice sweetness that’s evident in the flavor of the dressing. Peppery arugula forms the base of the salad. Next time, I might add some endive spears, too, for added crunch, as the arugula wilts quickly once the dressing is applied. Marcona almonds and shavings of Manchego cheese complete the dish. You’ll want to roast more grapes than are called for in this recipe. That’s because once you try one, you’ll be hard pressed not to eat them all. Take my word on it. Make more to save the extra roasted grapes in the fridge to adorn a cheese plate, top vanilla ice cream, stir into your morning oatmeal, crown slices of roasted pork loin or to just eat out of hand like candy, one by one. To make the vinaigrette: Preheat oven to 375 degrees. Place shallots and garlic on a baking sheet. Coat them with the olive oil and season with salt and pepper. Roast them for about 45 minutes, or until browned and lightly caramelized, turning them midway through roasting. Let cool. In a small food processor, combine shallots and garlic, and puree. Add vinegar and mustard, and pulse. With the machine running, slowly pour in the olive oil, and blend until the dressing is emulsified. Season with salt and pepper. Before serving, stir the dressing thoroughly. To make the salad: Increase oven temperature to 450 degrees. 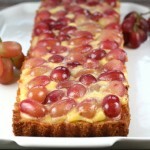 Put grapes on a baking sheet, drizzle with olive oil, and sprinkle with salt. Roll around the grapes until evenly coated. Roast for about 15 minutes, or until lightly browned. Let cool. 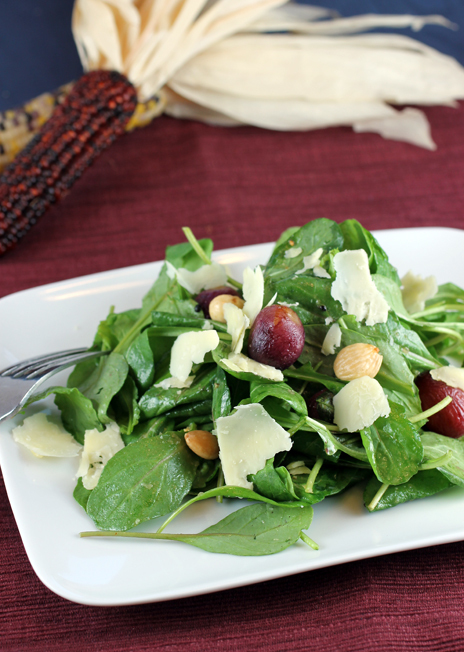 Combine the arugula, grapes, cheese, and almonds in a large salad bowl. Pour enough dressing over the salad to moisten it, and mix to combine. Divide among salad plates and serve. Party Prep: The vinaigrette may be prepared up to 1 week ahead, covered, and refrigerated. Bring to room temperature, and whisk before using. The grapes can be roasted 8 hours ahead, covered, and refrigerated. The salad can be assembled up to 2 hours ahead, covered, and refrigerated. Dress the salad just before serving. Note: Use the dressing on many other salad greens or as a marinade for chicken or fish. You can easily double the vinaigrette for a larger salad. Instead of Marcona almonds, other nuts can be used, including toasted pine nuts, walnuts or pecans. A gorgeous salad! Magnificently autumnal. Caroline!! You’re indeed THE Food Gal!! You’re such a terrific writer when it comes to describing food!! I almost drooled while reading your descriptions! Thanks for featuring this cookbook! I love seasonal cookbooks! Why have I never roasted grapes?!! I’ve roasted just about every other fruit and vegetable, but never grapes for some reason (though I like to bake with them). This looks so terrific – really inspired. Thanks so much for this. 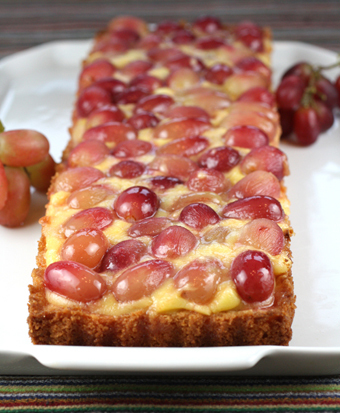 I’ve never roasted grapes, but this recipe looks absolutely wonderful. I love arugula salads, and this looks a simple way to add a totally new taste. Roasted grapes – now that is definitely a new one. I love your description of their flavor. It definitely makes me want to make this salad. I have a large wedge of Manchego in the fridge so all I need are some grapes. Thanks for sharing this recipe and this cookbook! i was so skeptical the first time i heard about roasted grapes, but they really are quite lovely and a wonderful addition to many things! Roasting grapes: what a clver idea! This arugula salad with the roasted grapes & that lovely well flavoured dressing sounds divine! 🙂 MMMM! A really good idea, especially now with grape season in full swing. I discovered the cookbook Seriously Simple Parties when I was in a specialty store in northern California, not realizing I had the author’s The California Cook autographed copy from an earlier visit to Sonoma and some recipes from that book have become staples in my kitchen. This was the first recipe I tried and it was wonderful. The roasted grapes are amazing, with the intense sweetness offset by the slight saltiness. I used Manchego cheese and roasted pine nuts, and the combination was exceptional. Everyone loved it, and of course I was asked for the recipe. OMG! Roasted grapes are INCREDIBLE!! Of course I had to pre-try some tonight and gosh darn, they turned out to be seeded ones, and I can’t *possibly* serve those to holiday dinner guests in a salad, right? So I had to eat EVERY SINGLE ONE of them myself!!!! Thank you (yet again) for the discovery of another amazing delicacy, Carolyn! Carroll: The roasted grapes are like candy, aren’t they? Wishing you a delicious and joyful holiday, too! Served it in Parmesan frico salad baskets. It was the talk of the table; both gorgeous — and delicious!